Hello everyone! Kristina and Millie from 2CrochetHooks! We are so excited to be here on Oombawka Design today sharing an easy/beginner level pattern for fingerless gloves with a simple ridged cuff. 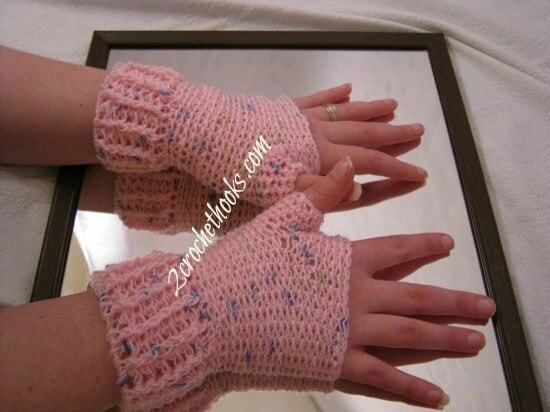 These cute fingerless gloves let you work and play while staying warm and fashionable! Thank you to Rhondda for letting us pop over to crochet with you all today! FPDC: Yarn over, insert hook from front to back to front around post of corresponding stitch below, yarn over and pull up loop [yarn over, draw through 2 loops on hook] 2 times. Basically stick the hook in beside the stitch you are working with from the front (so put the hook from the front to the back through the material in between the DC and the DC to the right of it). Then stick the hook back out of the other side of the stitch (from the back of the material back up between the DC and the DC to the left of it), so now your DC is lying on top of the hook. Yarn over (grab your yarn with your hook) and pull it through and finish out your dc as usual. Now you will have a dc on the row you are on and the dc on the row below it will be sticking up a bit. BPDC: Yarn over, insert hook from back to front to back around post of corresponding stitch below, yarn over and pull up loop [yarn over, draw through 2 loops on hook] 2 times. Basically the opposite of FPDC. Stick the hook from the back of the material up between the DC and the DC to the right of it. Bring the hook over the DC and down between the DC and the DC to the left of it. Yarn over pull up, finish off your DC as usual. This time you will have a DC on top and the one on the bottom will be pushed back some. BLO: If you are looking at your stitch there are two little strands at the top of the stitch. Normally to work a stitch you would stick your hook under both of these little strands. For BLO you will stick your hook in between them from front to back so that you just have the back strand (or loop) of the two strands on your hook. This causes a horizontal ridged effect. Chain 31, ss to join, or until the chain is slightly tight around your wrist, it will loosen as you stitch. Row 20: SC BLO even for 23 stitches, chain 8, sk 7 stitches and ss to join. This is the side of the thumb hole. 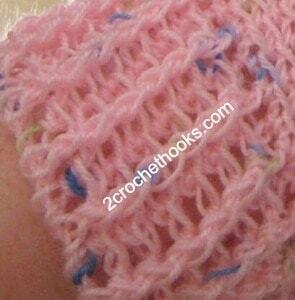 Row 21- 26: SC BLO even around to where the ch over the thumb hole starts and sc even in the chain. Finish off and weave in all ends. Wear and enjoy. Note: You can continue going higher, as high as you want up the hand (toward fingers). You can also attach yarn to the thumb area and go around the thumb hole to make a thumb cover. You can make the cuff longer by continuing to do the FPDC and BPDC as long (or as short) as you want the cuff before switching to SCs. Suggestion: To make the gloves tighter around your hands start with a shorter chain and/or for larger hands, start with a longer chain. I have small hands so 27 is perfect for me; for the average woman 30 is typical; for men’s hands try 33-35. You can experiment to get the pair the perfect size for the hands you are trying to fit. The cuff is designed be loose and stretchy. If you get to the end of the cuff and find the gloves are not tight enough around your hand try a couple decreases till it fits perfect. Alternatively if it is too tight add a couple increases until it is the perfect size. We hope you had fun crocheting with us today! Keep warm! 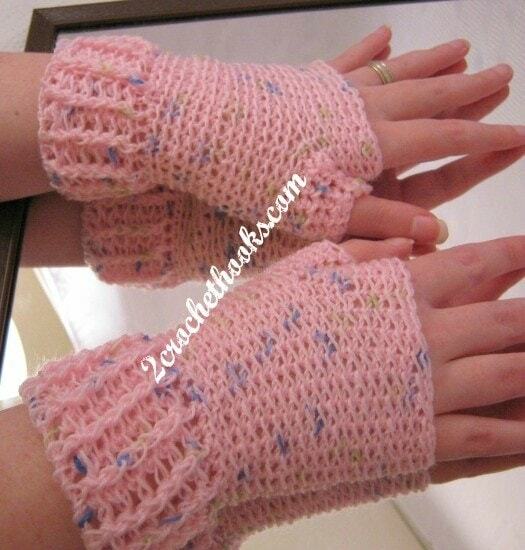 On behalf of the Oombawka Design Readers and myself, I’d like to thank Kristina & Millie for providing this easily customizable fingerless gloves crochet pattern. I love the lacey style ridged cuff design. By following the suggestions you could make these in any size easily! these look perfect for what I need. thank you. loving this web site. I really should start making some of these for this winter here in IL. I used a pair when I was living in KY. and had to take care of the chickens I was raising. They are great when you have to do some work in the cold! I made these gloves, several times, even for some friends in Central America out of very light fingerling yarn and the ridged cuff was the winning edge every time! Thanks for a great pattern. I will try this pattern for my plumber son, only in a darker color than pink lol. I have done several of this type and usually knit them but will definitely try this crochet. thanks Rhondda for letting us crochet with you again 🙂 We always have a great time hangin’ out here!